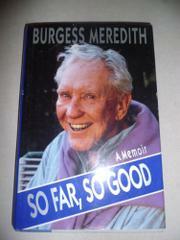  Feisty memoirs of a blazing youth in the theater and a slow evolution into an outstanding character actor. At age 24 Meredith (b. 1909) was hailed as the greatest young actor in the American theater for his performance in Maxwell Anderson's poetic drama Winterset (Anderson later wrote High Tor and The Star Wagon for him). But he has been around so long--more recent roles include the Penguin in the Batman TV series and Sylvester Stallone's aged trainer in the Rocky movies--that few readers or moviegoers under 40 have any idea that he was once the brightest light on Broadway, notorious for his inspired nuttiness. Meredith prefers to pass lightly over his awful childhood with an alcoholic father, but he still relishes the memory of his triumphant opening night in Winterset--as well as his equally overwhelming reception that night by Tallulah Bankhead, who met him stark naked at the door of her apartment in the Gotham Hotel, fed him cocaine, took him to bed, and at the critical moment pushed him aside. Meredith peaked early as Prince Hal in Orson Welles's Shakespearean history marathon Five Kings, though he stayed on top as a leading actor with the parts of George in Of Mice and Men and Ernie Pyle in The Story of G.I. Joe. He served in the Army Air Corps during WW II, was blacklisted in the '50s, and directed Zero Mostel in Ulysses in Nighttown during the '60s. Many of his tales involve his flirtatious wife, Paulette Goddard, as well as Charles Laughton, John Huston, Kurt Weill, Lotte Lenya, Charlie Chaplin, Marlene Dietrich, Jimmy Stewart, and his decades-long friendship with John Steinbeck. Charm by the buckets, with a bright eye and wicked brilliance.